Returning to former General-Major Tazekhulakhov’s article in NVO . . . to make VKO an integral organism under unitary leadership and command and control, with personal responsibility for solving the tasks laid on the system, Tazekhulakhov believes it best, in the current Armed Forces structure, to concentrate troops (forces) and VKO system resources in one service or troop branch. Give VVS PVO (including air defense aviation) to KV, and turn KV into a new branch called VVKO. Disband KV, give RKO to the VVS and space launch, monitoring, and other supporting structures to RVSN. Using KV as the base, create a new branch VVKO by including those VVS forces and resources currently in OSK VKO (the old KSpN, Moscow AVVSPVO, Moscow Air Defense District, etc.). Without transferring or resubordinating any of VVS or KV, establish a Strategic Command of VKO (SK VKO), and designate a commander to whom every MD / OSK, and every PVO, RKO, and REB resource would be subordinate for VKO missions in peace and wartime. 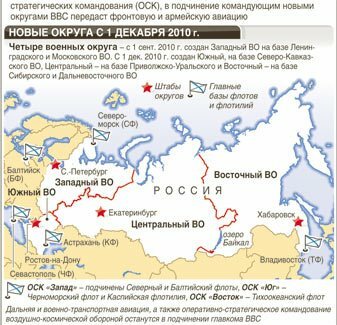 Divide VKO along the existing MD / OSK lines with each of the four commanders responsible for the mission with common command and control exercised by the RF Armed Forces Central Command Post (ЦКП ВС РФ). Tazekhulakhov says none of these possibilities is ideal. Currently, VKO elements belong to different services, troop branches, Armed Forces structures, and even civilian departments. PVO and RKO forces and resources aren’t evenly distributed throughout the RF. And some are operationally subordinate to regional MD / OSK commanders and others (RKO and REB) to the center. Triple subordination — administrative, operational, and support — violates one-man command for the VKO system. Tazekhulakhov says the first three variants ask service or branches to perform missions outside their traditional competence. Variant four would require agreement on the authorities of the VVS CINC, MD / OSK commanders, and the SK VKO commander. Variant five makes it hard to find one commander responsible for VKO. Of all variants, Tazekhulakhov finds variant two best. It keeps the current integrity of VVS, and cuts one branch and reduces command and control organs. But he’s found another problem not yet addressed — how to treat operational-tactical PVO and PRO of the MDs and fleets. For it to operate on the same territory and with the same missions as strategic VKO, reconnaissance and warning information exchange and command and control and REB coordination has to be worked out. And MD / OSK commanders won’t want to subordinate their forces, plans, and responsibilities to a VKO commander. Voyenno-promyshlennyy kuryer published an interview with the Chief of the General Staff, Army General Nikolay Makarov last Tuesday. It’s not exactly a hard-ball interview. But it’s fairly consistent with his other statements. Among the priorities, preserving mobilization appears again. Inter-service C2 in the new OSKs is a big theme. He can’t explain why the Air Forces aren’t getting more new aircraft, and PVO sounds like it’s destined for joining VKO under the Space Troops. VPK asked about the possibility of changes in Russia’s military doctrine following the NATO-Russia summit and more talk of a strategic partnership. Makarov said the approach of NATO infrastructure to Russia’s borders and the alliance’s continued “open door” policy vis-a-vis Ukraine and Georgia are still factors in Russia’s military doctrine. Therefore, there’s no need to adjust it. Resolving social protection issues of servicemen. Asked about military science and operational training, Makarov said the main task of the military-scientific complex is to “support the training and employment of the Armed Forces in their new profile, especially inter-service training of the military command and control organs” of the new MDs / OSKs. He says the General Staff has given the OPK requirements for high-tech digital reconnaissance and communications systems. Industry is already developing a fundamentally new, sixth generation radio system with digital signal processing to implement a net organization in radio communications. He says it’s being built as a unitary, integrated net at all levels, from the General Staff to the individual soldier on the battlefield. Command and control systems will get 300 billion rubles under GPV-2020, according to Makarov. Sounding very much the net-centric warfare disciple, Makarov says the main task is to form a unitary information space uniting reconnaissance, navigation, command and control, and new generation weapons. Makarov doesn’t have a good answer when asked why the Air Forces don’t have a single fully reequipped unit despite increased defense expenditures. He maintains they are getting new aircraft and their units are now all permanently combat ready and fully equipped and manned. Obviously speaking much prior to last week’s news about reversing cuts in the officer ranks, Makarov addressed the moratorium on inducting new cadets. He said 78.5 percent of 2010 VVUZ graduates became officers. Others, he says, who wanted to stay in the service were temporarily placed in lower-ranking [i.e. sergeant] posts, but will participate in command training and form a cadre reserve for filling officer positions. Lastly, Makarov talked about the new military pay system coming next year. Military retirees have been especially concerned about its effect on pensions. Makarov didn’t say much to assuage them. He said there will be no difference in pensions depending on when servicemen retired, and a commission under Finance Ministry leadership is working on the issue. That will probably reassure army pensioners. On Thursday, Argumenty nedeli said its source claims Defense Minister Serdyukov will soon send some well-known generals into retirement. The Defense Ministry press service, of course, denies it. General Staff Chief, Army General Nikolay Makarov (61). Deputy Defense Minister for Rear Services, General-Colonel Dmitriy Bulgakov (56). Air Forces CINC, General-Colonel Aleksandr Zelin (57). Navy CINC, Admiral Vladimir Vysotskiy (56). Space Troops Commander, General-Lieutenant Oleg Ostapenko (53). It’s interesting because none of them is really up against the legal age limit for leaving military service. And Makarov apparently already has a service term extension from President Medvedev. One presumes, according to AN’s information, that the Ground Troops CINC, and RVSN and VDV Commanders are safe for now. AN also expects some of the newly appointed MD commanders to be dismissed or moved to new posts. There are other angles to AN’s story besides more rotation in cadres. First, it repeats earlier press on trouble in finding a replacement for “key military department figure,” former Deputy Defense Minister for Finance-Economic Work Vera Chistova who left her post three months ago. An AN source in the Finance-Economic Service claims the lack of a replacement puts in doubt Prime Minister Putin’s promise to deliver a 6.5 percent increase in military pensions on 1 April. Budget resources weren’t allocated for this. And there’s still no candidate to replace Chistova. And without one such issues simply won’t be resolved. AN doesn’t mention also that as active duty officer pay is reformed this year, the Defense Ministry will have to figure what to do about retiree pay. If, as expected, they break the long-standing link between active pay and military pensions, the vets aren’t going to be very happy just before the 2011 and 2012 elections. Putin just courted representatives of veterans’ organizations about a week ago. According to AN, the Defense Minister has offered the military finance portfolio to more than one official at different levels in the Finance and Economic Development Ministries, but all of them declined. The military department’s officers are also talking loudly about the coming appointment of a new Serdyukov deputy who will be called in to “correctly” track the military’s political preferences ahead of the fast-approaching legislative and presidential elections. On Tuesday, General Staff Chief Nikolay Makarov provided his year-end wrap-up on the ‘new profile’ of the Armed Forces in the form of a press-conference featuring a videolink with the four new MD / OSK commanders. Rossiyskaya gazeta paraphrased Makarov’s remarks, giving only a couple direct quotes. First up was President Medvedev’s call for unified aerospace defense (VKO) before the end of 2011. RG says Makarov said VKO will be fully operational in 2020 when new reconnaissance and weapons systems have been deployed. He said its purpose is to defend the state [interestingly the state, not the country] from ballistic and cruise missiles. It needs to be an umbrella against any kind of threat, including low-altitude ones. Makarov said different military structures have been occupied with the security of the skies. Space Troops do orbital reconnaissance and ground-based missile early warning. The air forces and air defense armies (АВВСиПВО or АВВСПВО) and radar troops monitor air space for approaching hostile aircraft. The Special Designation Command (КСпН) covers the Moscow air defense zone [didn’t this long ago change its name to the OSK VKO?]. Air defense troops (ЗРВ) and fighter aviation cover other important facilities. The system was set-up on a service (видовой) basis and that’s why it was uncoordinated. It needs to be made integrated and put under the command of the General Staff [of course – this sounds like Olga Bozhyeva in MK]. In the Defense Ministry, they understand unification won’t be quick and will require a lot of resources, but there’s simply no other way. According to RG, Makarov said a modern army would be useless without a new command and control system for the Armed Forces. Russia’s move to a unified information environment will cost 300 billion rubles, and will be phased, with the initial phase being the replacement of all analog equipment with digital systems by 2012. Command and control systems will be developed and produced in Russia, but other weapons will be bought abroad. This is when he broke the news about Mistral winning the amphibious command ship tender. Olga Bozhyeva viewed this as a total reversal of Makarov’s earlier rejection of contractees and insistence on conscripts as the backbone of the army. Of course, he didn’t mention who will take care of large numbers of retirees left behind in that archipelago of abandoned military towns. KZ paraphrases more of Makarov. The personnel training system caused complaints. VVUZy were teaching the Great Patriotic War. Low pay and poor prospects for housing made the officer’s profession a low-prestige one. In units, personnel weren’t occupied with combat training, but serving themselves, and military discipline fell as a result. On the whole, the Armed Forces stopped fulfilling the missions for which they are intended, and could scarcely react to threats and challenges beyond the state’s borders and inside the country. Then Makarov brought in MD commanders over the video so they could attest to how it’s going. They remarked on how cutting intermediate, redundant command levels has made their jobs easier. Western MD Commander, General-Colonel Arkadiy Bakhin said 40 percent of his formations and units have outsourced some support functions. KZ says earlier MD commanders answered only for Ground Troops, and when they needed forces from another service or branch, they had to get permission from above. Southern MD Commander, General-Lieutenant Aleksandr Galkin claims making these requests cost the commander time, but now all forces and means are in one command, the fundamentally new unified strategic command (OSK). Galkin also says freeing soldiers from support tasks means there are now 20-22 training days per month instead of 15-16. Possibly, yes, but it remains to be realized and proven . . . since the very same forces have just been aggregated in a new way. Is this new whole more than the sum of its parts, or not? Attendees discussed unified logistics as well as unified combat forces. Reports said along with unified commands a unified system of material-technical support (MTO) is being established in the military districts. As previously reported, it is supposed to unite arms supply and logistics in one function and organization. At any rate, the collegium had new or semi-new business as well . . .
Serdyukov, Makarov, and other attendees also discussed Defense Ministry outsourcing. Speaking like an old-hand, Makarov said the outsourcing system will take care of noncore tasks like feeding the troops and providing utilities to military towns. The Defense Ministry’s board of directors discussed transferring responsibilities and corresponding property to these contractors. Are they going to operate or own these assets? RG reminded readers 340,000 troops are supposed to be fed by civilian firms by year’s end. They include students in cadet corps, Suvorov schools, military VUZy, and patients in Defense Ministry hospitals. The paper said outsourced food service would be coming soon to permanent readiness units. And laundry services, part of military transportation, and equipment supply, including aviation, POL, and support for all deployed Navy ships, will be outsourced. Not sure how much they make on this scrap sale. Not so long ago the Defense Ministry said it was cutting repairs (as well as RDT&E) to focus more money on buying new systems. Gerasimov himself went from Commander, Moscow MD to become a deputy chief of the General Staff. The Defense Ministry now wants the other three new MDs / OSKs to be functional by 1 October.